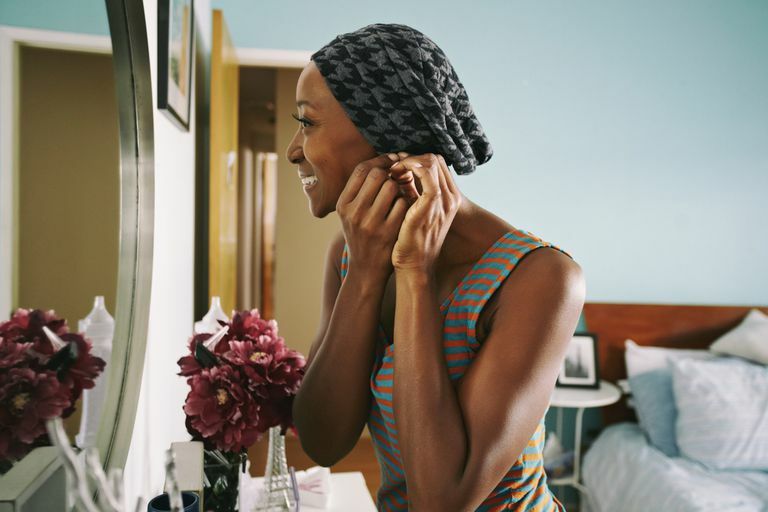 Going through chemotherapy can take a toll on your self-image, particularly if you lose your hair. You might be considering a wig, but have you ever thought about using a cap or turban? A cute cap is such a great, inexpensive alternative to a scarf or pricey wig. The right cap should fit your head very snugly, like a headband, providing warmth, comfort, color, and cover during chemotherapy. Caps won't blow off, as hats may do on a windy day. Most caps are not expensive, but if you love a bargain and want some caps during chemo for breast cancer, free caps are even better. Most clinics and hospitals have a collection of free chemo caps and scarves on hand for patients. Ask your infusion nurses or clinic social worker where you can find free caps. At the clinics where I had chemotherapy, the nurses usually had a box full of donated caps and other headgear. You can dip into the box and find some truly beautiful, free caps. Look Good Feel Better is a service for people going through chemotherapy or radiation treatments and is staffed by volunteer cosmetologists. Both men and women can find sleep caps, free hats and help with skin that is dry from cancer treatment at a Look Good Feel Better workshop. Women can find free wigs, caps, and makeup at meetings. To find a Look Good Feel Better Workshop near you, visit their website or call their toll-free number, 1-800-395-LOOK (1-800-395-5665). Have you tried a breast cancer support group? In addition to patient assistance, information, exercise, and encouragement from other survivors, support groups often have free caps for patients. Sewing and knitting circles in your local community may create and donate chemo caps, sleep caps, and turbans to cancer support groups. Look around for a Gilda's Club, a Wellness Community or Breast Cancer Resource Center and ask about their services. You may start out by getting a simple free cap but come away with lots more support for your journey. Call it what you like—vintage, resale, or secondhand—these are the stores that you need to visit for inexpensive caps. For a modest price, you can purchase colorful caps, snoods, ball caps, turbans, watch caps, beanies, and berets. If you like to dress in an eclectic style to express your originality, you may find just the right cap or bonnet at a nearby Salvation Army, Goodwill, or Oxfam Store. Your purchase may help create jobs, overcome poverty, or alleviate suffering for others. That's a pretty good deal for an inexpensive cap. Crafty people have a secret: they stalk the sale bins at yarn shops, so they never pay full price! If you or a friend have an artsy streak, crochet or knit a cap from just a skein of yarn. Find a ball of soft yarn at about 1.75 ounces (91 meters) for $5 or less and invest a little time creating a unique cap. Scope out the bargain shelves for the $1 yarns or look for yarn at garage sales. The same principle applies to fabrics: a soft fleece cap can be made with less than a yard of fabric that you find marked down in the scrap box. If you make more caps that you can wear, donate them.